Before I sew up a few of the new spring patterns I just bought, I wanted to make a few more of my planned stash busting projects. Sewaholic Lonsdale is a perfect dress for that because it calls for 3-4 yards of fabric. Actually, that's part of the reason the pattern was sitting in my stash because I hardly ever buy more than 2yd of any fabric. However, I really liked Lauren's version from years ago and bought some rayon challis with this dress in mind. 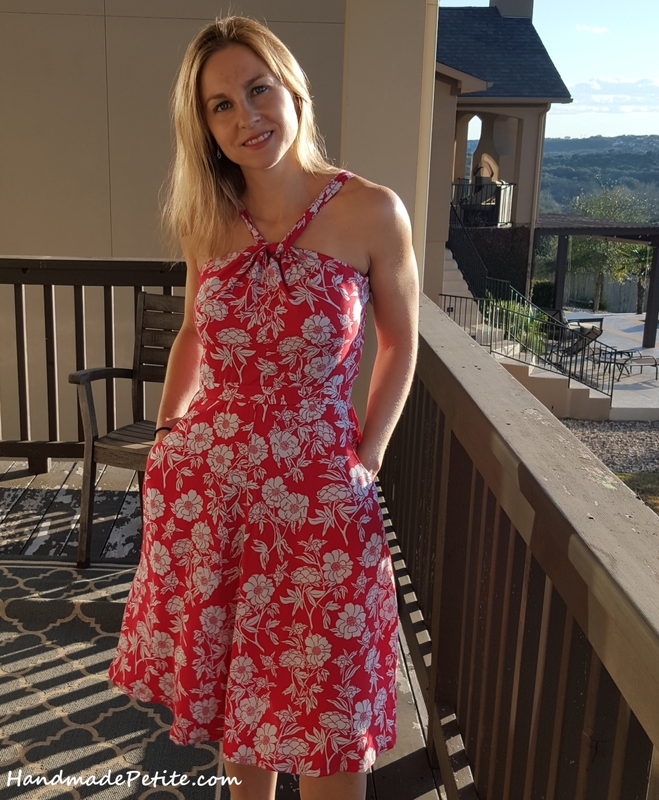 There are so many versions of the dress on the sewing blogs over the years that I don't think I have anything new to add, but there were a few tweaks I've made that will likely apply to other petites and I made two versions in different fabrics one right after another, which made for an interesting comparison. The first dress I sewed up out of the envelope without any mods. I know the dress worked without fit adjustments for a lot of people so I decided to try the same and call this a muslin if it didn't work out. It's actually not bad and can be worn in public, but there were a few things I tweaked on the final version. - Shortened the bodice by 1/2" in the front and almost 1" in the back. My back is shorter because I have a bit of a swayback. - Changed bodice from size 4 to 2. Usually I size down the bottoms in sewaholic patterns, but keep the top as-is because I'm not pear shaped. However, this bodice was a little loose under the arms. I had to really pull on the straps and tighten the bow for it to look right. Size 2 was a bit snug at the waist, but fit a lot better in the bust. Got rid of the bow. I know, I know, everyone loves the bow on this dress. I agree that it makes the dress easier to fit and is a fun feature. However, I know I'll be wearing the dress a lot with cardigans in the office and pretty much anywhere indoors in the summer because businesses blast AC. The bow is not attractive under a sweater. Two, I dont want two completely identical dresses. Three, I really need someone else to help me tie the bow to make sure it's snug and to make it look pretty. Most of the time I'm getting ready on my own and am in a hurry so I didn't want to deal with it. Lastly, no bow also means less fabric :) I shortened the skirt a bit, but I was able to make this dress with 2.5yds or less than the recommended 3. The only word of caution when removing the bow is to think ahead and get rid of the loops on the dress when sewing the bodice. I didn't and then it looked really odd. 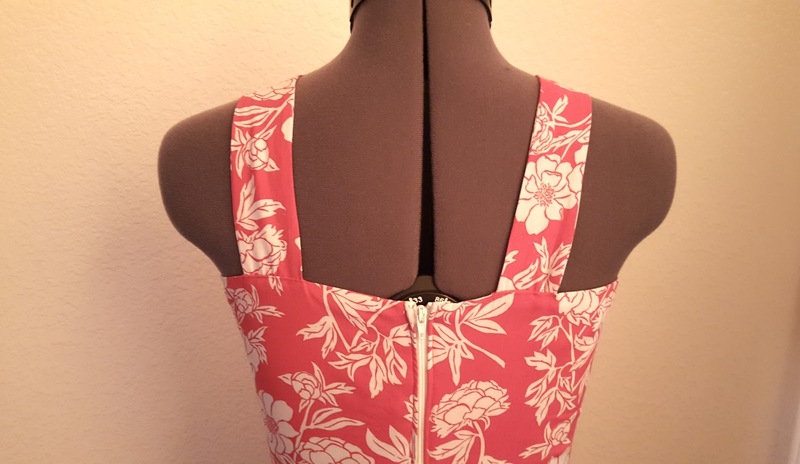 I had to get my seam ripper out to undo them and then sew in the straps by hand into the same holes since the bodice was already turned right side out and closed. The muslin was made from lightweight cotton that I got from Fabric Mart in 2014 Julie's club mailer. 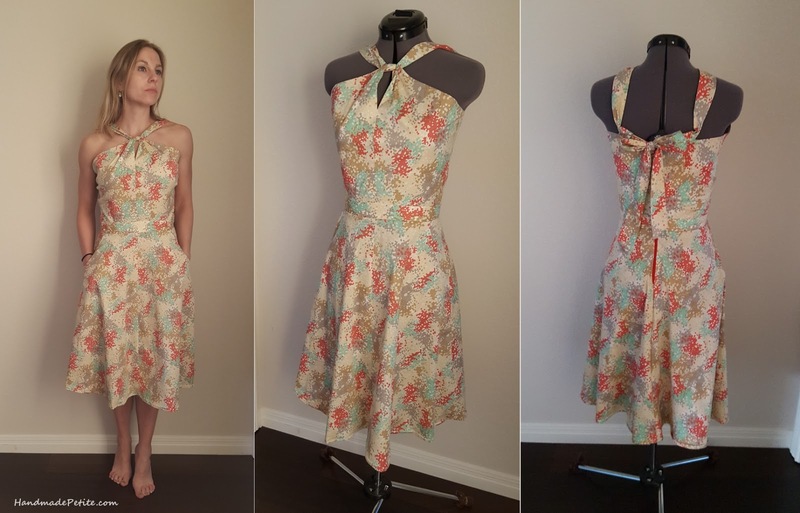 The final dress is made from rayon challis, specifically Peony Scarlet by Valori Wells Novella. Both are great, light summer fabrics. However, challis has a softer drape compared to a cotton that has more body. I think this pattern works well for either. I like the skirt on the cotton version a bit more, but bodice on the challis hugs my curves more and is super comfy and light. Perfect for Texas summers. Here are some more pictures. 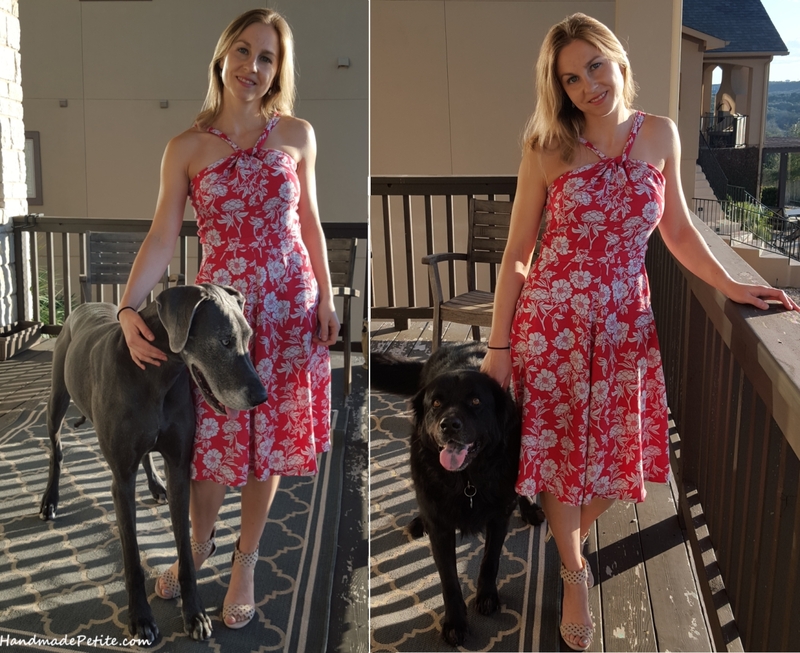 Both of my dogs took turns posing with me on the deck this time and I just couldn't cut one of them out. Final thoughts on the dress. Yes, it's a great pattern and I get why so many people raved about it. I like the front twist detail and fit versatility. I love the pocket - both placement and ease of sewing. I like the fully enclosed bodice. By the way, I self lined mine and it worked well even with light challis. The pattern is also pretty straightforward to make. I didn't take pictures of the inside, but I used french seams on the skirt to keep it neat and made bias tape from the same fabric for binding around the center back seam. I think 2 versions of the same dress is enough for now, but I would definitely recommend this pattern if there's anyone else still out there who hasn't tried it.